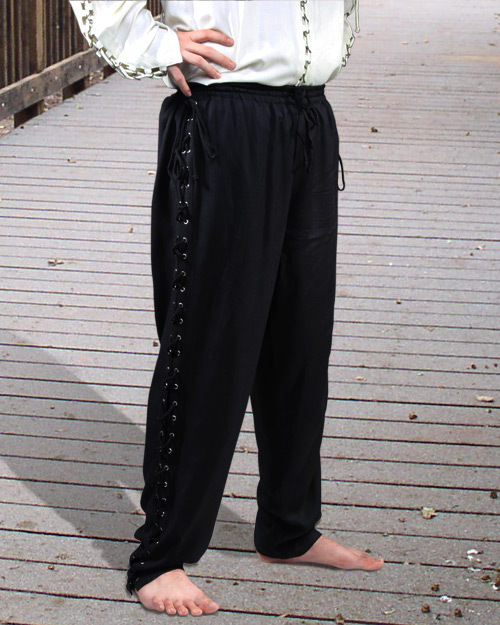 These Medieval low-rise pants have metal grommets and laces the full length of both legs for a custom fit. The elastic waist makes them comfortable to wear all day. Black only. Sizes S to XXL (see size chart). To order, choose size from the dropdown list, then click "Add to Cart". Waist 27-31" 30-34" 33-37" 36-40"
Inseam 24" 24" 23" 23"
Length 42" 42" 43" 43"